A short hike from Koghb or Noyemberyan is Mshkavank, a 13th century monastery whose 5th-6th century triple-nave Basilica church was most likely built on top of a Pagan temple. The monastery is known for its 12th c. gavit, or assembly room, which was constructed in the same time period and similar to the gavit at Haghpat (a UNESCO site, about an hour drive to the Lori region). The monastery contains many old stone carvings and khachkars. For anyone interested in Art History, Mshkavank would be an excellent stop in the Tavush region. The layers of styled architecture and decorations from different time periods are obvious even to the untrained eye. 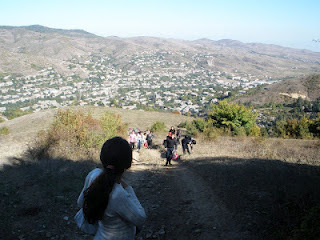 Mshkavank is a popular hiking destination for locals during the warmer seasons, but is hard to reach by vehicle. Often, classrooms go on field trips here to discuss the historical significance of the site, light a candle, or enjoy the forest. 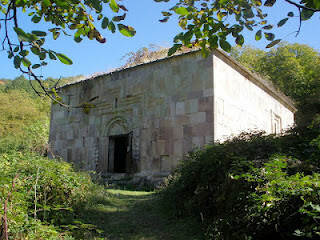 Finding a guide to accompany you to Mshkavank from Noyemberyan in warm weather should not be a problem. There are a couple hotels in Noyemberyan, English speakers at each bank, as well as a group of Peace Corps Volunteers in the area (like me) who are willing to help! Danelle is an American Peace Corps volunteer who lives and works in Tavush marz. Stop by you through bloggers. You have a cool blog with very informative posts on Armenia Tourism. Looking forward for more posts on other locations. Truely entertaining blog. And always fresh. Thanks, and keep going. What is Easter in Armenia? @Armenia Tourism Blog. Awesome Inc. theme. Powered by Blogger.